A Tonk's Tail... err, Tale...: Save a Pet, Save your Life! This infographic was created by Carlton Hobbs, LLC and NowSourcing, and it's worth sharing. 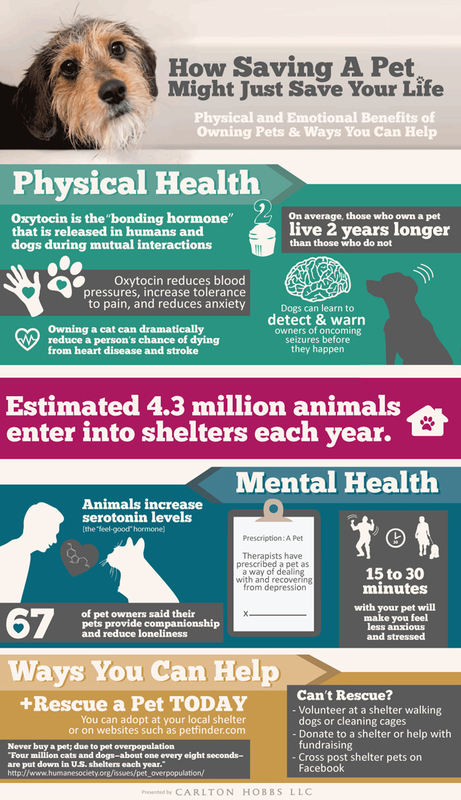 We agree - saving a pet is the healthy way to go! We want to reiterate that last point. Many wonderful, deserving animals are sitting in shelters right now, waiting for someone to give them a home. Please adopt if you can. And if you can't...? Have you considered the number of man-hours a day it takes, just to give each poor dog a 30 minute potty break and leg stretch outside? That's 25 man-hours, the equivalent of three 8-hour work days, each day. And that's not taking into consideration other tasks like feeding, cleaning and medical care, plus other maintenance. The same goes for shelter cats. If they get even 30 minutes of socialization time a day, those hours add up. Shelters depend upon volunteers like you to keep them afloat. So if you can't adopt, please consider volunteering. Do it for that sweet, deserving animal trapped in that cage who desperately longs for his forever home. We collect toys etc for our main London shelter and we think it is good to help where you can. Have a lovely Monday. That's wonderful, Molly! Those shelter pups surely appreciate your kind efforts! We agree completely! AND, we warm up the bed nicely, too. I am hoping the toys that my human is donating from the CWA conference will offer lots of enrichment to the kitties at the rescue she is going to! Maybe she should help out with this "enrichment," huh? We shoulda changed that, we think. Some people can't volunteer their time, but they can donate toys and needed supplies - like your human does! Three cheers for your human!! That IS a great graphic! My peeps say that with all the loving, sweet cats in shelters, they had to adopt an ornery one. HAH! AND I won't allow them to get another one. Loved this!! Austin and I need to talk!!! I wish more humans knew this. We're reaching the wrong group - somehow we need to get this across to the non-pet-owners. If they only knew what they were missing. I feel my beans get healthier!!! I hope every kitties and woffies has their forever home soon.